A PLEASANT tour from Haddington is by East Linton and Whitekirk, then round by the coast, Tantallon and the Bass, to North Berwick. After East Linton you keep on the left bank of the Tyne. At Tyninghame you note the charming cottages almost buried in flowers. East Lothian is far before most of Scotland in the neatness of its peasant homes. Elsewhere you come on choice bits that prove the Cottagers of Glenburnie no false picture, but not in this pleasant countryside. After Tyninghame the highway runs through a fine stretch of woodland. Of old this was bare moor, but the sixth Earl of Haddington, at the beginning of last century, set to work to plant on a great scale. As one master schemed and directed everything was done with method. Great avenues of trees led to a glade, and thick holly hedges rose in double walks or avenues, now alone and again interspersed with other trees. The late Queen was here in 1878 and confessed it reminded her of Windsor and Windsor Forest. Her Majesty was happy in her visit. Three years afterwards, on the 14th October 1881, a storm of almost inexplicable violence burst on the forest, destroying some 30,000 trees and marring the symmetry of the whole. It is still pleasant, but if the best of it be seen from the highway, it is not to be compared with many an English sylvan scene. You are no sooner out of the wood than you climb a little hill into Whitekirk, the church whereof, with its square tower and antique porch, has come down from distant days less injured than is usual in the north. It has a notable record. Its first legend is that of St Baldred of the Bass. In the eighth century he flourished—one might irreverently say vegetated—on the Bass, where he stuck close as limpet to rock—was hermit there, in fact, for ever so long. Finally he died in the odour of sanctity, whereupon the three parishes we have just traversed - Prestonkirk, Tyninghame and Whitekirk—contended for his remains. Things looked serious, for relics were then held valuable assets, but the spiritual guides urging their flock to take rather to their devotions than their fists, surprising results ensued. Three St Baldreds were found next morning instead of one, so like that there was literally not a hair to choose between them. The parishes had one a-piece. The church was dedicated to the Virgin Mary, and Our Lady of Whitekirk was a person of great repute in mediaeval Scotland. When Edward III. invaded in 1356 some sailors from the fleet wandered up here, and one of them impiously plucked a ring from Our Lady’s finger. Down crashed a crucifix on his skull and stretched him lifeless on the floor. The tars stripped the church, nevertheless, but the ship that bore away the spoils was presently lost on the sands of Tynemouth. Some eighty years afterwards Æneas Silvius made his famous visit to Scotland. In a pilgrimage to Whitekirk in the depth of winter, with more piety than prudence, be trod barefoot ten miles of frozen ground. Long afterwards, when as Pope Pius II. he ruled the Church, many a gouty twinge in his poor feet hindered him from forgetting that far-off shrine by the Northern Sea. This Pope was a Piccolomini. The family which gave two Popes to the Church had, and still has, its seat in Siena. Our pilgrim enriched the cathedral of his native town in one way and another. You see in the library a fresco by Pintoricchio, representing James I., the King of Scots, receiving the future Pope on his aforesaid visit, and the background is a landscape. If it be East Lothian it is highly idealized, for the vine and the myrtle are not plants indigenous to that soil. There is an imposing-looking barn just behind the church—some sort of monkish grange, no doubt. There it is ridiculously averred Queen Mary spent two nights. Queen Mary was a good deal about those parts. She probably hunted or hawked over every mile of them, but why she should have put up at a barn, when she had a choice of Hailes and Dunbar within easy reach, it were hard to say. In the churchyard there is this odd epitaph on a youth of nineteen who died in 1805: "We can say this without fear or dread that he was one that feared God and an ornament to society." In epitaphs most of all a little learning is a dangerous thing. The sign-post here is misleading. It indicates a way to North Berwick which is hilly and comparatively uninteresting, though the shorter as far as space goes. Better to go right opposite for that will take you pleasantly round the coast, which you join just where the old castle of Tantallon stands on its cliff facing the Bass Rock. Tantallon to-day is a show place. They charge for admission and it is carefully kept up. 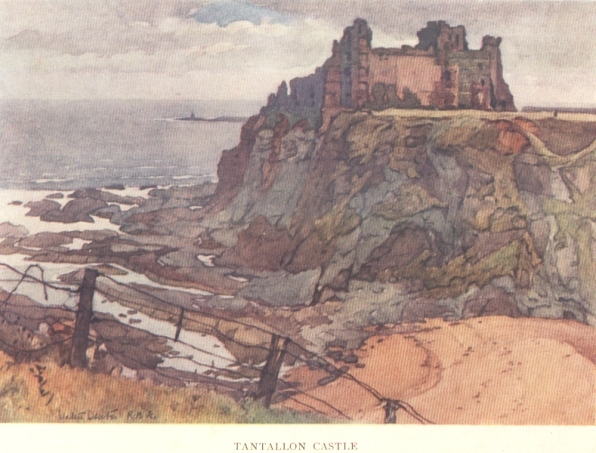 I have no doubt the money is used for needful repair and watching, but Tantallon, like a hundred other places, was more enjoyable when you went about it as you liked and there were few visitors and no hindrances. But then North Berwick and the places about it had not "arrived" in so tremendous a fashion. Tantallon is the limit of the ordinary tourist stream. There is a continual coming and going of traps of all sorts, not only between it and North Berwick but right on to Edinburgh. Tantallon has all the interest a ruin can have. Its situation is delightful, its history exciting. Genius has touched it with magic wand. It stands on a great cliff over the Firth, there opening into the North Sea, and right opposite is the great Rock, a couple of miles out, you learn, though it appears quite close. The outer walls of Tantallon are so entire that you would hardly call it a ruin. "Three sides of wall like rock and one side of rock like wall" is Hugh Miller’s admirable description. It is a mere shell, but even were it otherwise ruins look best from the outside. There is a dovecot near at hand. The "ducat" is a marked feature of the Lothian landscape. They do not build them now. I think all I ever saw look considerably over a century old. Perhaps wood pigeons are so plentiful that they do not repay the trouble. Tantallon is bound up with the fate of one family though it be no longer theirs. In history and romance it must always be the property of the Douglas. With good eyes and good will you can still trace the bloody heart above the gateway. You remember how the good Sir James set off to carry the heart of the Bruce to the Holy Sepulchre, how be died on "a blood-red field of Spain," and how his master’s heart and his own body were brought back to Scotland for burial. Hence the sign in the shield. This poor shell was once deemed of fabulous strength. Mak’ a brig to the Bass,"
"Gousty schaddois of eild and grisly deed,"
Save Gawin ne’er could pen a line!" Is Tantallon haunted? A place with such memories ought to be, but the only story is one a century old and altogether comic. A rascally shipwrecked sailor, a Scots David Pew, in fact, took up his abode with some comrades and robbed right and left, but always during the night time. Noises heard at dark in the old ruins were naturally set down to the devil. Only when the old salt’s scarred and grim visage, surmounted by a Kilmarnock night-cap, was seen, the very embodiment of the actual, was the truth divined. The castle was stormed for the last time and the band routed and dispersed. And now, brig or no brig, we must get us over to the Bass. It stands 420 feet above the water, one huge mass of homogeneous trap, as Hugh Miller tells us. You are taken over from Canty Bay, a small hollow in the cliff which is, and always has been, the port for the Bass. You will choose a reasonably calm day for your pleasure excursion. There is but one landing-place. The Bass is all precipice except one side, and this slopes down from the top. Near the bottom it narrows. A fortification is built across, and below this is the small platform on which you land. You peer into the prisons of the martyrs and climb up to the little ruined chapel which goes by the name of St Baldred’s cell, and so on to the top. You note the heavy red-coloured flowers, the tree-mallow, and there are the sheep and the thousands and thousands of sea-birds with their hoarse call. One little change recent time has brought. A lighthouse has been built, and after many years the Bass has again a resident population. Some effects of wind and weather on Tantallon and the Bass are very striking, as at sunset, when the shadow of the great rock stretches for leagues over the sea; or, again in still moonlight, when Tantallon seems a fairy castle; or yet again in a great storm, when the ocean rollers dash spray and foam far up those rocky sides and make the mass shake and echo till it reels on its base. Here is R. L. S. with an admirable impression. "It was an unco place by night, unco by day; and there were unco sounds; of the calling of the solans, and the plash of the sea, and the rock echoes that hung continually in our ears. It was chiefly so in moderate weather. When the waves were anyway great they roared about the rock like thunder and the drums of armies, dreadful, but merry to hear, and it was in the calm days when a man could daunt himself with listening; so many still, hollow noises haunted and reverberated in the porches of the rock." There is a bore or cavern right through the Bass, which at low tide it is possible to traverse. The opening is half blocked up by a rock. It is 100 feet in height to start with, but it narrows down presently, and in the middle is a dark pool. As it twists you do not see right through. It is dark, damp and dismal. It goes right under the ruin of the old chapel, and through and back again is somewhat under a quarter of a mile. The Bass, like Tantallon, has a romantic history. First comes St Baldred, to whom the little chapel may be said to belong, though it is centuries after his time. The story we have told shows his reputation for sanctity. He wrought miracles in his life as well as at his death. Thus a rock which inconveniently stood between the Bass and the shore floated at his command to an out-of-the-way cliff and was henceforth known as St Baldred’s Cockle Boat, and there is St Baldred’s Well, and St Baldred’s Cradle, and St Baldred’s Statue and what not. Later, the place was held by the ancient family of Lauder of the Bass. One of them fought in the Scots Wars of Independence, and they had touch with the Rock for about five centuries. Their arms were a solan goose with the legend, Sub umbra alarum tuarum, which strikes you as exceeding irreverent, but meant no more perhaps than that they derived considerable profit from the birds. The island was a prison and fortress. A sure holdfast! Even if you broke your cell, how to get away from the rock? The first prisoner mentioned is Walter Stuart, son of the Duke of Albany, regent during the captivity of James I. He and his father and one of his brothers were beheaded, and their heads shown to their mother, then a prisoner at Tantallon. The old lady controlled her feeling. "They died worthily," she said," if what was laid to their charge was true." But the prisoners of the Bass were those confined on it fifteen years or so before the Revolution for their adherence to the national faith—the covenanting divines, in other words. "Feden the Prophet" was sent here in June 1763 and remained for four years, "envying with reverence the birds their freedom." Most grievous the prison to him of all men, for he had roamed far and wide over the wild hill districts of the south, and though be complained that he had got no rest in his life it is not like it was such rest he desired. How admirably the stem, gaunt figure is touched off in Catriosa: "There was never the wale of him sinsyne, and it’s a question wi’ mony if there ever was his like afore. He was wild’s a peat-hag, fearsome to look at, fearsome to hear, his face like the day of judgment. The voice of him was like a solan’s and dinnle’d in folks’ lugs, and the words of him like coals of fire." And again: "Peden wi’ his lang chafts (Jaws) and lunten (glowing) een, and maud (plaid) happed about his kist, and the hand of him held out wi’ the black nails upon the finger-nebs-—for he had nae care of the body." Another of the prisoners was Thomas Hogg of Kilturn. He had incurred the special enmity of Archbishop Sharp, who ordered that if there was a place in the Bass worse than another it should be his. The cavern "arched overhead, dank and dripping, with an opening towards the sea, which dashes within a few feet below" was his gruesome lot. This was the donjon keep of the old fortress, and a very prison of prisons. James Fraser of Brea is another name. In his Memoirs he has left a somewhat minute account of the place and his life. He notes the cherry trees, "of the fruit of which I several times tasted." He tells that the sheep are fat and good, and asserts that a garrison of twenty or twenty-four soldiers could hold it against millions of men. Another martyr, John Blackadder, was most worthy of that name, since he died in confinement. His tomb and its inscription are still to be seen in North Berwick kirkyard. You do not wonder men died, rather that they could there exist. The rooms were full of smoke, they had sometimes to thrust their heads out of the window to get a breath of air. They were often short of victuals, for in wild weather no boat dare touch the place. All was damp and unwholesome. It was horribly cold during most of the year. Two lighter touches relieve the picture: "they were obliged to drink the twopenny ale of the governor’s brewing, scarcely worth the halfpenny the pint," and there is, or was, a huge mass of debris made up of "the decapitated stalks and bowls of tobacco pipes of antique forms and massive proportions." Every smoker will understand what a consolation tobacco was to the small garrison chained to the rock. With the Revolution of 1688 the history of the Bass draws near a close. It held out some time under Sir Charles Maitland, the depute governor, but surrendered in 1690. Then it was used to confine Jacobite prisoners— four young officers, in fact, taken at Borrodale. These ingeniously managed to turn the tables on their gaolers, whom they packed speedily ashore. By what their enemies called piracy, and themselves legitimate warfare on passing vessels they managed to support themselves very well and annoy the Government very greatly. They capitulated in April 1694, on favourable terms, for by repetition of well-known tricks they persuaded the enemy they were great in numbers and well supplied. Then the old fortress was dismantled, and in 1706 it was granted to Sir Hugh Dalrymple, President of the Court of Session, and it is still held by the descendants of that astute lawyer. One cannot leave the Bass without saying some words about its constant inhabitant, the Solan Goose. At one time it was thought that only here and at Ailsa Craig were these birds to be found. This is long exploded, but the Bass is one of their few strongholds. Old Hector Boece has many wonderful things to say of them. They bring so much timber to the island for their nests that they satisfy the keeper for fuel. He ungratefully robs them of their prey, for they have a nice taste in the way of fish, and appropriates their young. For themselves, their fat is made into "an oile verie profitable for the gout and manie other diseases in the haunches and groins of mankind." Hector avers that common people are much mistaken in believing that these geese grow upon trees, "hanging by their nebs, as apples and other fruits do by their stalks," the fact being that when trees fall into the sea they become gradually worm-eaten. Now if you look at the worms very closely you see they have hands and feet, and finally "plumes and wings." In the end they fly away— Solan Geese! The witty author of Hudibras must have heard of these theories. In the islands of the Orcades." It is difficult to believe that Solan Goose was ever looked upon as a delicacy, but Ray, the botanist, was in these parts in August 1661, and he tells us that the young are esteemed a choice dish in Scotland and a very profitable source of income to the owner of the Bass. As he ate of them at Dunbar he ought to know. But there is still better authority, since an act of the Scots Privy Council in 1583, ratified by an Act of the Scots Parliament of 1592, declared them to be "apt for nutriment of the subjects of this realm." Also the minister of North Berwick, who is officially vicar of the Bass, is entitled to twelve Solan Geese per annum, which gives him a month to digest each bird. It is averred a one-time innkeeper of Canty Bay used to supply them when a beefsteak was ordered, and that the guests only found out when told. That innkeeper had a very pretty wit, but this cuisine pour tire was a dangerous experiment. You easily believe the story, for as you swallow your Solan Goose you hesitate as to whether you are eating fish, flesh or fowl, or a combination of two, or all of them. I have never heard that the Solan Goose is served up at the various palatial hotels which abound on the near coast. The Bass has other marvels: "that herb very pleasant and delicious for salad" which is of no good anywhere else; that stone which has the property of changing salt water into fresh; that still delicious mutton, surely the best gjgot du pre salé which hath ever enjoyed the highest renown. Here was sure the happy hunting-ground of the old-time Caledonian gourmet, if such ever flourished among an all too serious race!